Features: Easy to stick.Easily removable without damaging your wall.No harm to the environment and health. Made of Acrylic; The mirror decals can be fixed easily by provided double sided adhesive and also portable as a decorative mirror. This acrylic wall decor is non-toxic, non-friable, environmental protection and anti-corrosion. It is as clear and reflective as class mirror, but not sharp and fragile without any damaging. Can be applied to any smooth surface, such as glass door, window pane, ceramic tiles in kitchen or bathroom, glasses, home appliance, air-condition, and car body. 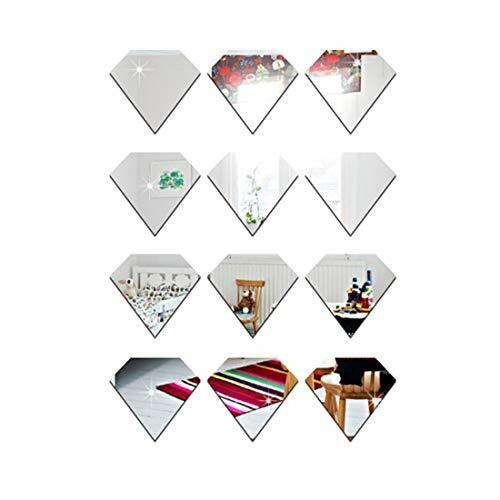 The wall mirrors decorative sticker can be easy to paste and removed without harm to your wall. There is a protective film which is used to protect the surface. Please peel it off before using. It is ideal to decorate different occasions like TV backdrop, Sofa Wall, Window, Door, Closet, Freezer, Cabinet, Tiles, Nursery, Bathroom, Bedroom and Office. If you have any questions about this product by UINKE, contact us by completing and submitting the form below. If you are looking for a specif part number, please include it with your message.